We have been searching in galleries and artist workshops all over the world for you again. After creating new works of art, our artists provide exclusive thumbnails, which we are happy to share with you at this point. Get an overview of our limited editions! 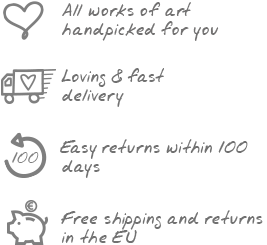 Of course, high quality product paintings follow as soon as the first works arrive at KunstLoft. We will reward your patience with a 5% discount on this piece if you reserve it before it is officially available in our new selection. Pre-order it ahead of time and get your discount!